The first game of the day was against Horsham. The Jersey girls started strongly and were applying lots of attacking pressure in the oppositions half. They were able to win several short corners all in quick succession however the girls were unsuccessful in converting any of these opportunities into a goal. Horsham then had a quick break that almost resulted in the first goal of the game but the defence did just enough to prevent a Horsham lead! The first goal of the game came towards the end of the first half with a lovely interception from the midfield and the shot was saved well, but fast reactions from the Jersey forwards saw the rebound slotted away by Kirsty Ludlum. Jersey were put under a lot of defensive pressure in the second half with Horsham passing the ball well, the girls rode this out and found their groove again with a number of shots narrowly going wide. With Jersey passing the ball quickly Horsham were struggling to stick with their players, allowing the girls lots of room to move in; the ball found its way to Gabi Knight at the top of the D who’s quick shot was blocked, once again fast reactions from Kate Jubb on the rebound put Jersey U16’s ahead by two goals. Jersey dominated this game and were very unlucky not to score more throughout the game, the final score was Jersey U16’s 2 Horsham U16’s 0. After a short break the second game against Trojans pushed off with an aerial from Izzy Heelis which caught the defence off guard allowing for some quick attacking play. Very quickly Trojan’s came back fighting and were a strong attacking team. They were awarded a short corner and their shot was blocked well by Lucy Brandie, unfortunately Jersey were unable to clear the ball from danger and Trojans took their chance well scoring the opener inside the first 10 minutes. Jersey girls responded well with numerous shots at goal but a strong goalkeeper in the opponents goal made it hard to get the equaliser. A great tackle lead to a turn over from the midfield in Jersey’s favour and a fast run from the halfway line by Heelis confused the defence she was able to create some space and got around the keeper to level the game 1-1. This goal encouraged the travelling team who ended the second half with the majority of the play. A very even second half followed with the ball going from end to end. Both teams were defending tightly and neither team were going to give up easily, Jersey grew in confidence as the game progressed and were defending from the front putting Trojans under a lot of pressure close to their goal.A quick counter attack from the home side led to a short corner and them taking a 2-1 lead. Again the Jersey girls did not let their heads drop and replied swiftly after with a free hit taken quickly the ball found its way to Heelis who again dribble around the goalie to level the game 2-2. With the clock winding down Jersey were becoming the more dominating team attacking well down the wings and getting the ball into dangerous positions. With two minutes left the girls won a short corner. Heelis opened up space and managed to again get past the keeper to get her hatrick and make the score 3-2. Knowing there was not long left the girls tried to keep the ball in the Trojan half and were ecstatic when the final whistle went. The final score was Jersey U16’s 3 Trojan U16’s 2. It was a great day and all the girls performed well in the games, there is a lot of potential in this young squad. 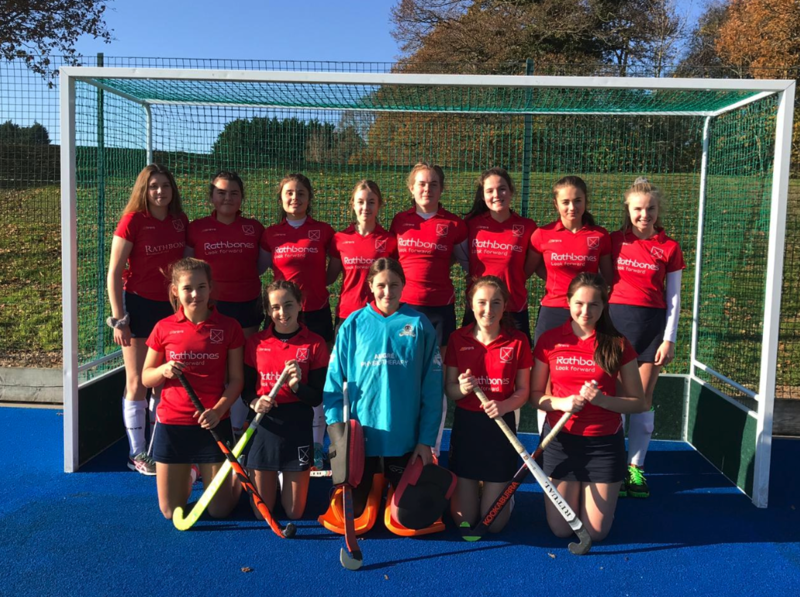 Squad: Gabi Knight, Kate Jubb, Clemmie Carnegie, Charlie Cornwall, Lucy Brandie, Kirsty Ludlam, Lena Holden, Bridget le Brocq, Caitlin Hogan, Holly Stearn, Izzy Heelis, Katie Doyle, Olivia Maryon. Coaches: Ciara McQuaid, Alan Morris, Lauren Jehan.